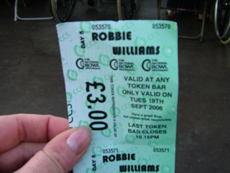 When Wembley Stadium wasn't ready on time, Robbie moved his gigs to Milton Keynes. This meant quite a drive, and I considered getting a refund. I'm glad I didn't, because even though disabled access at the venue was ropey the performance itself was fun. Robbie seemed tired, and had just announced that he would be postponing the following gigs, but he still gave a good show. To use the bar, you had to buy tokens at £3 each, then exchange them at the bar for a drink. Unfortunately there wasn't room to get my wheelchair between the barriers to the token seller. Fireworks from the stage announce Robbie's arrival. Here he is, marching on stage and down the walkway. After singing "Me and My Shadow" they had a competition to see who could kick a football furthest into the crowd. Nice for the people at the back! Looking our way at last! ...then back down the walkway. After calls for an encore, Robbie appears on top of the stage structure. I'm really not sure about the white and green outfits that the backing singers were wearing for the encore. A shot of the band and Robbie during the final song, Angels.